There is no way to nail down what imagination is, but for me it’s metaphor. Those with imagination seem to see associates here and there, more free with some than others. When creative people take tests sometimes they test closely to psychosis. A traumatic childhood, her father and brother died within one year of brain tumors. String theory of imagination, suddenly you wake up, repression and flashback, reincarnation and past life regression. Sometimes I’m given to thoughts of the supernatural. At least 7 levels of anxiety, a preoccupation with death. We’re trying to create a symbolic form of immortality, what it is that might or might not continue to exist. People are going to watch what you’re doing and criticize you. Obsessiveness. Stories can try to capture an ephemeral moment. Accidents, coincidences, and luck. I visited a remote province in China, they have no written form of their language, was part of work for the opera I’m working on. She went back as part of a story for National Geographic, but between the first visit and the second, there was a fire and a fifth of the homes were destroyed. The average per capita is less than $100. The fire was caused by a man whose quilt had fallen into the warming fire, and the son of the man was banished to several kilometers from the village. They felt it was because of bad Feng Shui that the city was still cursed to an extent. The story ended with a flood, and she asked the Feng Shui master if he thought the luck was still bad, but he said it had hit the entire province and it was just bad weather. They simply needed to rebuild and get on. This entry was written by Matt, posted on December 4, 2007 at 10:52 am, filed under Session and tagged amy tan, eg2007. Bookmark the permalink. Follow any comments here with the RSS feed for this post. Post a comment or leave a trackback: Trackback URL. 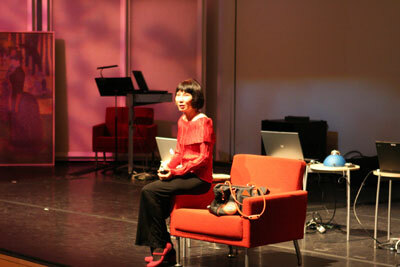 You may be interested to listen to Amy Tan’s talk on March 2008 . Hope you’ll enjoy it as much as I did.